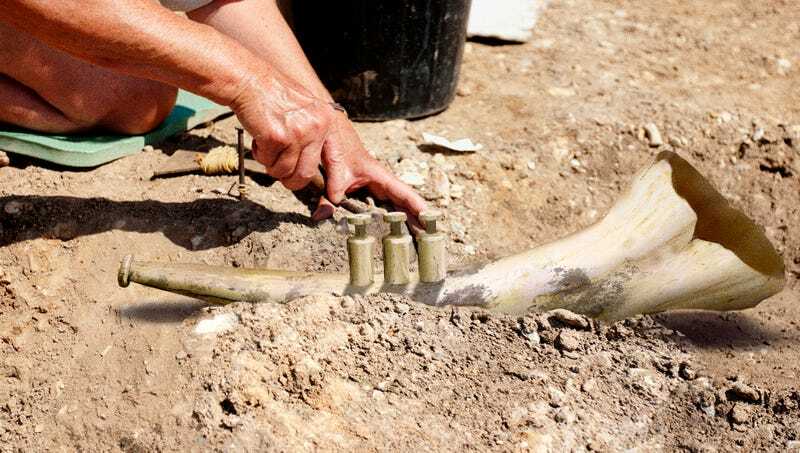 BATON ROUGE, LA—In a discovery that may indicate the Jazz Age began thousands of years earlier than traditionally believed, a team of archaeologists from Louisiana State University announced Tuesday that they had unearthed a completely intact mastodon-ivory trumpet. “This horn is our first insight into the possible existence of hepcats who could really blow them horns 12,000 years before Buddy Bolden and Louis Armstrong,” said LSU’s Dr. Liana Brower, adding that wear patterns on the horn indicated that Pleistocene cool cats were indeed cutting loose with those hot sweet swing licks before the invention of the wheel. “While it’s too early to be certain, it’s quite possible these jazz daddies from way back first laid down the sweet sounds that evolved into our own bip-boz-dee-boze dee-bop-biddly-bop and push-ka-pee-she-pie.” Brower cautioned that the archaeological dig was in its early stages, dig, but the discovery of more horns, or even a saxophone, would testify to one hip, hot happenin’ scene for early man, man.